Over 30 enthusiastic young gardeners showed up to work in the Echo Lake School Native Plant Garden last week. Spring has arrived! The students were treated to a tour of the Garden before starting work. Some trees and shrubs have budding leaves; other plants will bloom soon. Three plants are already blooming: Stream Violet, Indian Plum, and Red-flowering Currant. 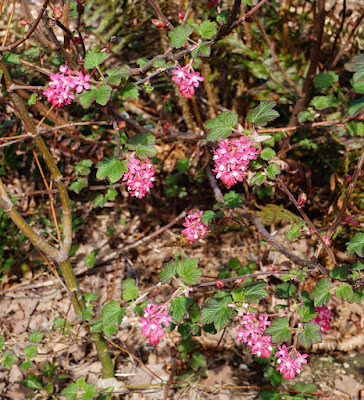 The Red-flowering Currant is a hummingbird magnet and an Anna’s flew by the excited kids while they were working. 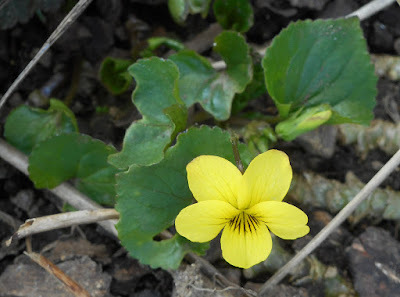 At the beginning of the session, only one Stream Violet was in bloom; by the end, five were blooming. The kids, and adult volunteers, marveled at how the Garden changes by the hour! The students loved their assigned tasks. The young gardeners deadheaded plants to make way for new growth, helped create a record of what is happening in the garden, and inventoried and measured the logs marking the pathways, because some need to be replaced. There is much work to do! Are there any enthusiastic adults available to volunteer around the noon hour, on Thursdays, or Fridays? If that is you, please call the school, 206-393-4338.